1st Choice Security Systems are the leading provider of security systems and electric gates in St.Albans. With almost 10-years experience installing, repairing and servicing electric gates in St Albans, we can install a gate in any environment — from large factories to private homes. Our installation team specialises in bespoke electric gate installations, were every detail is perfectly crafted to suit the operating environment. Everything from the gate opening mechanism to the materials used to construct the gate can be customised to match your specific requirements. Access control mechanisms can include wireless transmitters, access cards, digital keypads and identification scanners. When combined with an electric gate, they provide a high level of security without substantially slowing access for authorised users. Video surveillance systems can be used to view and record the identities of people attempting to access the property. Paired with an electric gate, video surveillance can be used to remotely grant access to authorised personnel or residents. An intercom system is also very useful when working in conjunction with an electric gate and a video surveillance system. Automated systems can be added to give emergency vehicles access to your property in the event of an accident or fire. Some of the tools used to accomplish this include automatic siren detectors, emergency light detectors and radio receivers that work with the two-way radios in emergency vehicles. Electric gates can be constructed from a wide range of attractive materials that add curb appeal and resale value to your property while improving your personal safety. For busy commercial or industrial properties in St Albans, an electric gate can help deal with a high volume of vehicles entering or exiting a location. When combined with other security mechanisms, it is the best way to ensure a secured area stays under your control. There are thousands of burglaries committed in the Hertfordshire each year, which makes the necessity of strong security measures around your property very clear. There were 422 incidences of a burglary reported in Hertfordshire for the month of August (2015) alone. In the year leading up to August 2015, there were 7069 incidences of a burglary reported to police. Not only will electric gates reduce the risk of a burglary being committed on your property, it will also reduce the risk of other trespass-related crimes including arson and vandalism. 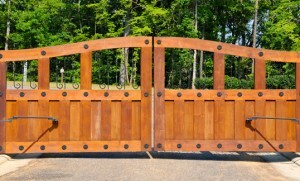 The most commonly used type of electric gate. The gate door simply slides horizontally to form the gate opening. Suitable for most types of installations, slide gates normally use rollers that make contact with the ground. Similar to a sliding gate, however instead of using rollers on the section of the gate that opens, a cantilever gate is supported by rails that run along the inside of the fence. The section part of the gate that opens “hangs” and does not touch the ground. This can be a useful feature in installations where it is impossible to use rollers on the gate opening. This type of gate simply uses a barrier arm that is rotated out of the gate opening. A common sight in parking garages, the electric barrier arm gate is useful for installations that do not have much horizontal space. A vertical pivot lift gate functions in a similar way, with the pivot located near the ground to swing the entire gate. The gate is simply moved upwards on rails. This form of gates useful for installations with limited horizontal space or other restrictions that prevent the use of rollers. These gates use two panels that contain folding hinges. The gate opens in a similar fashion to bifold doors in a home. They do not require much space for installation. We have been providing the highest quality security solutions in St.Albans for nearly a decade. In that time, we have installed electric gates in a large range of environments, from factories with thousands of entries per day, through to private residences where the gate is used once a week. Safety is always our primary concern when installing, maintaining or repairing an electric gate. Our electric gate installations always conform to all necessary safety requirements. Some of the mechanisms we use to ensure safety include operation warning sounds, photoelectric sensors, pressure sensors and safety cages. All installation are performed in-house by our experience and qualified technicians. 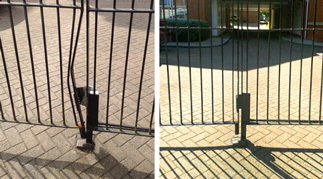 We take pride in the reliability, efficiency and safety of our gate installations. Our proven ability to install bespoke electric gates and automatic gates in St Albans makes us the best choice for your home or business. 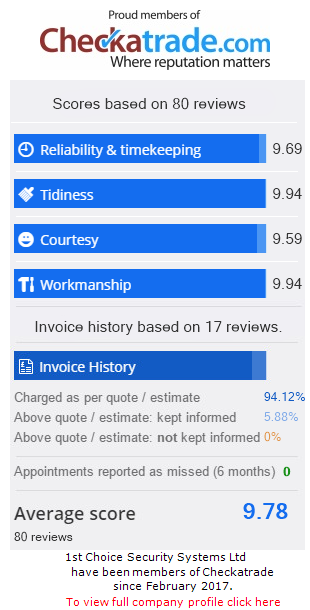 Contact us today or call 0800 118 2414 for a no obligation quote!